Creative Diagnostics is an evolving biotech company providing highly purified protein/ recombinant antigens worldwide. The protein/recombinant antigens are rigorously tested to meet the research and development demand for excellent quality, uncompromising biological activity at competitive prices. Creative Diagnostics offers extensive expertise across expression systems for producing protein/recombinant antigens to support customs’ antibody generation. When you choose CD to develop protein/recombinant antigen for your antibody development, the end use application of your antibodies are considered during every phase of antigen production. Creative Diagnostics provides rapid, high-level bacterial expression and purification of protein antigens to our customs. Our team utilizes both BacTEC™ protein soluble technology and FoldEZ™ protein refolding technology to achieve protein soluble expression and refolding. Besides, we generate OxiCyto™ competent E. coli strains to enable the correct formation of disulfide bonds in proteins that require them for biological activity. Bacillus subtilis expression system, which is an ideal option for the expression of monomeric protein products, combined with our patented fermentation protocols allow us to offer fast process development and scale-up service to meet your antigen needs. Yeast protein expression system is the most economical eukaryotic expression system for both secretion and intracellular expression. Our expertise in protein expression spans both P. pastoris and S. cerevisiae expression systems. Our YeastXceed™ Technology considers promoters, optimal copies of vector per cell, inducibility, signal peptides, and cellular location, which are essential for high-level recombinant protein production. Many secretory proteins that bacterial expression systems yield as insoluble or as inactive inclusion bodies can be produced successfully by our yeast expression system using native or yeast secretion signals. BacuFlex™ Baculovirus/Insect Cell Expression Platform was developed by our in-house team of scientists for virus production and expression of proteins from baculovirus-infected insect cells in flexible scale. There are several advantages of insect cells over E. coli such as improved solubility, ability to incorporate post-translational modifications, and higher yields for secreted proteins. 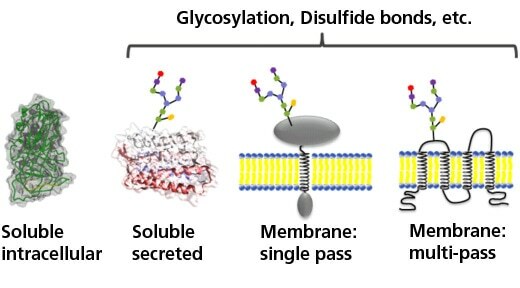 Mammalian cells have the ability to perform most comprehensive post-translational modifications and to secrete glycoproteins that are correctly folded and contain complex antennary oligosaccharides with terminal sialic acid. Therefore, Mammalian antigen expression is the system of choice for many proteins that are difficult to produce and for antibody generation projects where detection of native antigen is required. Our Mammalian expression HostOptim™ systems enable generation of high yielding production systems across different industry relevant platforms (e.g. CHO, HEK, Pichia pastoris). Site-specific incorporation of a biotinylated amino acid allows reduction of the required antigen material down to as little as 5-10 μg for an entire antibody generation project. Our team has developed cell-free expression systems in combination with site-specific biotinylation to meet the increasing demands for this purpose. Now, in only two hours, we can produce biotinylated or other modified proteins starting from plasmid or linear DNA. Eukaryotic system: Rabbit Reticulocyte Lysates, Wheat Germ system. As a leading supplier of highly purified protein/recombinant antigens, Creative Diagnostics is proud to offer the highest quality antigens supported by extensive research, development, and validation. We are committed to the highest standards of product performance, and our scientists are dedicated to the goal of accelerating your discovery.